Beguilingly perched somewhere between the realms of fact and fiction, the legend of Robin Hood has fascinated people for over 700 years. 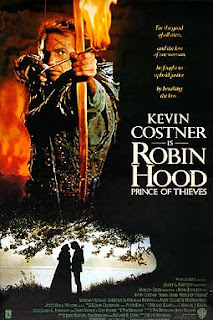 My personal knowledge is based largely on Kevin Costner's dashing portrayal of the hooded hero in the 1991 film Robin Hood Prince of Thieves and a sporadic dip in and out of the BBC's latest TV series. But do these modern day depictions bear any resemblance to any real-life historical figure? Did he even exist? Rather than embark on the University of Nottingham's new MA programme dedicated to England's national hero and most celebrated underdog, I decided to see if I could glean more from a trip to his famous home - Sherwood Forest - which is en route from Lincoln to Derbyshire. Though still impressive, these days, the ancient forest is shadow of its former self. Covering 450 acres to the northeast of Mansfield, Sherwood's 100,000 acres dominated the county of Nottinghamshire during the reign of King John and stretched 30 miles from just south of Sheffield to Nottingham. In Norman times, Sherwood Forest was a designated Royal hunting ground and was ruled by a special set of laws designed to preserve the King's 'vert and venison'. Surrounding a section of the Great North Road from London to York, Sherwood's 'vert' and its famous oak trees made it the perfect hiding place for bandits and robbers who made a good living out of ambushing wealthy travellers. 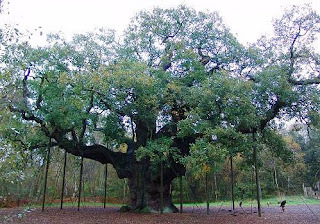 Sherwood's most famous tree is the hollow Major Oak which, according to legend was Robin Hood's prinicpal hiding place. With a girth of 33 feet, the Oak is said to be the largest living organism in Britain and, although you obviously can't count the rings of a hollow tree, it is said to be between 800 and 1,000 years old. It's a magnificent specimen - propped up by a system of scaffolding and iron manacles which were first fastened around its great branches by the Victorians in 1900. Age has not withered its ability to reproduce - in a good year, the tree can apparently produce up to 150,000 acorns. As for its fabled resident, no-one knows for sure whether or not the legend is based on a real historical character. The earliest written reference to Robin Hood dates back to a 15th century poem, but the boffins have yet to track down the one true Robin Hood, as Hood, Hode and Hod were all common surnames in medieval England. Robins and Roberts were equally popular so there are countless medieval law-breakers with variations of the same name. Apparently Russell Crowe and Sienna Miller are set to star in a Hollywood twist on the legend entitled Nottingham, which will controversially take the side of Sheriff of Nottingham - casting Robin as the baddie. Not for the first time, Hollywood will stand accused of 'sexing up' a British legend - Braveheart springs to mind - but to us Brits he'll forever remain our do-gooding national hero.